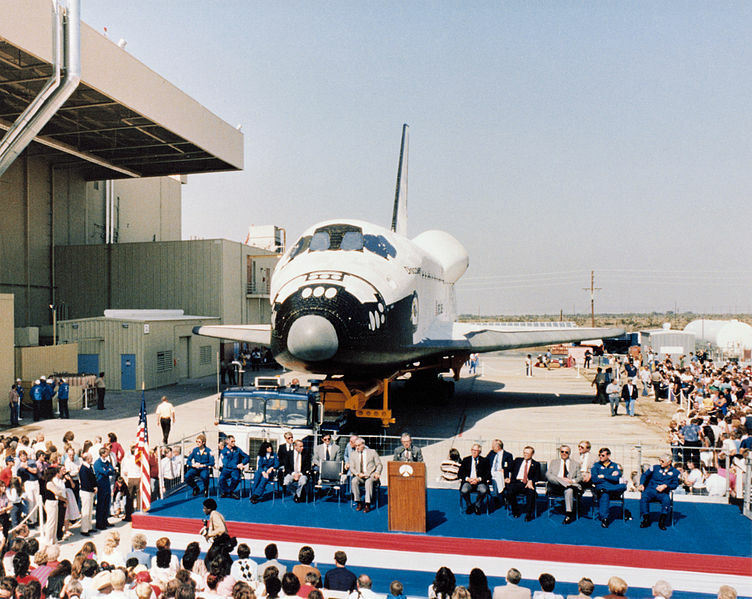 Today marked the end of an era for manned spaceflight, as the first of the operational shuttles has been retired by the NASA Space Shuttle Program. Discovery landed at Dulles International Airport today after a memorable flight over Washington, D.C.. The Smithsonian Institutes’ National Air and Space Museum will welcome the well-used shuttle into their exhibit. 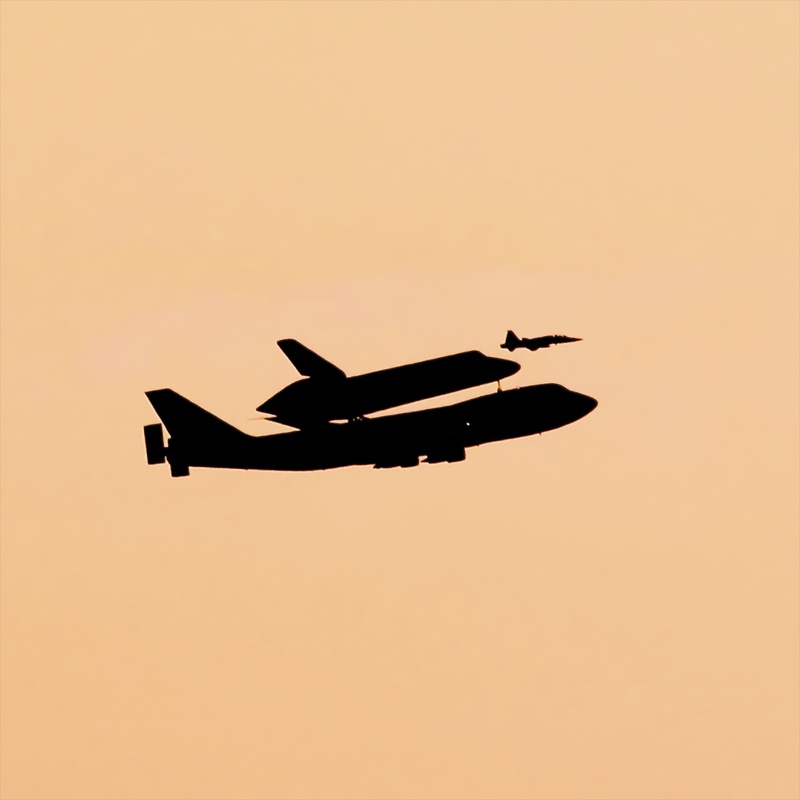 Eyes were on the sky in Washington as the flight granted spectators a final view of the shuttle in flight, piggybacked on a modified Boeing 747. NASA created a Flickr for those lucky enough to be along Discovery’s flight path and have taken photos. Space Shuttle Discovery was first introduced to the public in October 1983, and left for it’s maiden voyage on August 30, 1984. The shuttle landed successfully back on Earth for the final time March 9, 2011. After spending a cumulative year in space, over 39 missions, it’s position as NASA’s Orbital Flight leader has finished. While this is a disappointing day for space enthusiasts, it is certainly not a sign of the end of space discoveries. Many feel that NASA and space exploration progress has slowed to a point that it is in danger of regressing backwards. NASA plans to resume manned spaceflight in 2017. NASA’s Mars Missions will hopefully continue in 2018 with another rover mission. But new, private ventures into space are emerging, and may provide answers and opportunities in the present. My own current state, New Mexico, is at the forefront of space transportation. Spaceport America is currently developing launch vehicles as the world’s first commercial spaceport. Owned by the state and its people, this space launch facility is designed to with customers in mind, as well as attempting to inspire visitors. Since dedication in October 2010, the spaceport has successfully launched several vertical rockets. Most recently, the 10th launch reached the highest altitude on record for the facility. Additionally, Virgin Galactic has entered a 20-year contract with Spaceport America, with the spaceport serving as headquarters. Virgin Galactic’s space vehicles have already taken over the skies with their WhiteKnightTwo and SpaceShipTwo vehicles. Over 500 people have signed up to take flights into space. Including lucky number 500, Ashton Kutcher. New Mexico further aides in space-related progress through the New Mexico Space Grant Consortium (NMSGC). New Mexico State University (where I currently am attaining my Masters degree) is the lead institution for this program, which aims to support students in multiple disciplines with a united interest in aeronautics, space, and related fields. This PayPal funded company hopes to pick up where NASA budget cuts left off. SpaceX aims to develop launch vehicles that ultimately reduce cost and increase viability of space access. The jewel of the space fleet vehicles is Dragon, a free-flying craft designed for transport of (un)pressurized cargo and/or crew members. Dragon is scheduled to launch April 30 and will make history by docking with the International Space Station. While this flight is still considered a test, success would bring the company ever closer to becoming the first commercial carrier to deliver payloads. What are your hopes for the future of space exploration? Greetings from Long Beach! After a long night on the Greyhound, I’m at Cal State Long Beach for a few days to help a friend stay sane through her last thesis writing days. Hopefully, my own thesis will progress as well. If you followed my #bustweets on Twitter, you already know what an adventure the past day has been. I consider myself lucky to have arrived sane and vomit-free. Any complaints aside, I was able to travel via mass transit for cheap (way less than airfare) in a reasonable amount of time. I even slept for a few hours here and there. So why on Earth don’t more people travel by bus? This wasn’t my first rodeo. Ok, so it’s my second. 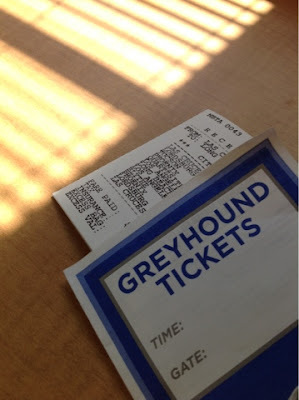 Last summer, I took those first teetering steps onto a Greyhound to attend a Surprise Birthday Party in Dallas, TX. Another smooth trip, with some characters along the way. I had planned to attempt to travel the West this summer with the Greyhound Discovery Pass, but unfortunately there is some distance between National Park entrance gates and the nearest bus stations. An adventure for another time, perhaps. Have you ever traveled between cities by bus? My mother is a self-proclaimed expert in the fields of ‘Worrying’, ‘Things That Can Go Wrong’ and ‘Worst Case Disaster Scenarios’, so if anyone has insight into this quandary, it would be her. She hits some pretty pertinent points. Bus safety is questionable. These people didn’t go through rigorous scanning, frisking, and searching. Sanitation is not a high priority on buses. Always travel with a towel. But how do buses compare to planes and cars in terms of speed, price, safety, and environmental impact? I bought my round trip tickets a week before departure. No airline could dream of matching the price and gas for a single passenger car would also add up quickly. Buses follow closely after. If one bus can carry 100 people, it would take at LEAST 25 cars to carry the same load. That’s 24 more opportunities to get into accidents. Lot of passengers and less fuel needed compared with air travel. As a grad student exploring new energy sources, I place importance on price and environmental impact. For me, taking the 17 hour bus ride is a no-brainer. I can spend riding time reading, sleeping, or people-watching. I can bring my own snacks and drinks. I can confirm that at the very least, the Phoenix station has goldfish crackers. Also, when I’m lucky the buses have free WiFi, another advantage over most airports. Safety and time would be useful to consider for families and business travelers. The young mother with three little girls (including The Vomiter) was mostly likely grateful that she didn’t have to drive and handle her crew. But once the eldest can entertain and watch over her sisters, then perhaps traveling by car will once more be practical. Travel is always going to be give and take with time, money, safety and comfort, but when the destination is worthy you will find a way. Luckily, I don’t have to depend on funding from the government, international cooperation, and years of innovation to visit my friend. If we as a global community truly want to explore and visit Mars, we’ll find a way. We may have to pick and choose our priorities, and exhibit endless patience, but the destination is a reward like no other. What is your favorite form of travel? What is your limit for time spent traveling by bus? What are your favorite travel snacks? If I were one to have a mantra, I suppose that might be a contender. It certainly sums up a lot of what I have done in my life, and what I want to continue to do with my future. Since many of my closest friends follow a similar life approach, we moved forward from a tightly-knit Kentucky community to a nationally scattered support group. However, we’ve agreed that once a year we will re-join forces to bring in each new year together. 2010 – We kept warm with positivity, love, and cheer in Chicago, IL. In lieu of new years resolutions, during our time together we complied the following list of phrases that we wanted to incorporate into our year. They became our 2012 Zing! Phrases. If this year was to have 13 mantras, I suppose these would be contenders. Why did I feel so inspired to apply? In yesterday’s video post, Dr. Tyson speaks about how we want to feel connected, feel relevant, feel like we are participating by just being alive. To add to this, I propose that we also want to able to make impacts, make changes, make things different by working hard and devoting our lives to doing. When I read that first article introducing me to the concepts of the study, my initial response was: I would be perfect for this. Close article. Back to thesis writing. Reopen article. This would be perfect for me. Close. Write. Reopen. I could help send a manned mission to Mars. It’s a lot, but I like it. Repeat. It’d be difficult, but this is a once in a lifetime opportunity to make a lasting impact. No fear in the New Year. And so, exactly one month ago, I decided to apply. 2013 – We will be together once more in a currently undetermined location. Perhaps it will be my last hurrah before traveling to Hawaii and entering the analog habitat for the first of 120 days. Travel, explore, learn. Fellow applicants, what prompted you to apply? Readers, is this project something you would consider? Why or why not?